About ……. Our Head Coach! I have been involved I the wonderful sport of swimming for several years. My personal love of this sport lead to me compete for close to 8 years, where my main stroke was butterfly, but I have always loved backstroke more! I always knew that I was going to teach swimming, and have been involved as a qualified teacher for over 10 years. I have taught people to learn to swim from the very smallest in the pool with their parents, through to adults who never learned the skill. I firmly believe that teaching everyone to swim is a basic life skill, that is vital to everyone’s safety and well-being. 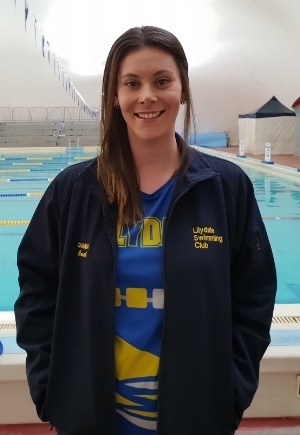 My coaching career started here at Lilydale, where I started as the assistant coach 3 years ago and have since then progressed on to becoming the Head Coach of this amazing club in 2018. I love seeing people from all walks of life, ages and abilities get involved in our sport - whether it is for fitness, competition, or for the social aspect that belonging to a Club brings. I love the friendships made, the knowledge that swimming brings you, the confidence you gain and the progress that can be made from it. I am always striving to bring out the best in my swimmers both in and out of the pool, just as my coaches encouraged and guided me. Outside of the pool, I train and practice Muay Thai on a regular basis; enjoy spending time with my rabbit, Rusty; and try to eat as much chocolate as I am allowed!